Hobbies such as BONSAIIn this materialistic competitive world travelling with jet speed a man is capturing the nature in many ways.likeway he is imprisoning the nature in his home too.trees that are grown in miniature form belongs to that type..these are called bonsai.there is no differance between ordinary trees and bonsai trees.they both are the same.but the maintanance and art to grow the bonsai tree in an order and dwarf form ,by cutting the branches,and by growing according to the style is the main formula in this.it does not need much space.These bonsai plants if not required can be replanted in the ground and can be grown back as an ordinary tree plant in farms.The shapes in bonsai are achieved only according to various styles created by a person learnt bonsai.We can grow in any place in our garden..Though how small the garden is these bonsai plants are cultivated according to the styles and forms in a dwarf form. 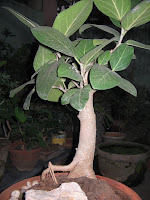 BONSAI-bon is a shallow pot.Sai is a plant.A tree like plant grown in a tray is called Bonsai.It is nothing but growing a tree like plant grown in a dwarf form,bringing Nature in a miniature form. Since thousands of years in China and Japan the Bonsai trees are being cultivated. Plants grown ingardens can be transferred in to pots,their branches and leaves after pruning,and bend by wires into a required shape,and the growth and shape of the plant to be minimized according to,can be cultivated and transformed as a beautiful bonsai.According to the history of the plant species,its growth ,the bonsai tree can be changed into bonsai pot after cutting and pruning for every 1 year to 3 years,depending on growth.According to the order the roots can be pruned and grown in bonsai pots. By doing in such a mannerthe bonsai tree minimized in size can be adjusted itself in a small bonsai tray.The bonsai tree should get water in required short intervels of time. Bonsai pot should be ofceramics, terracota or clay pot,as the bonsai tree really enjoys the coolness of clay pot.But for decency and the beauty the ceramic pots are used.The pot can be oval,round or rectangular or square in shape.Two to three large drainage holes at the bottom are required. The bonsai trees are classified into Mame,Small,Medium,Large,according to the variations in, the size.The bonsai trees live more than 100 years. Those who have a limited space area,or who live in flats can grow Bonsai trees,can maintain Bonsai Garden.